3 Chicks and a P - Fresh homemade hummus with only fresh, locally-grown herbs. Our Mission: To provide a high quality and locally made nutritious food product for residents of Schenectady County and environs. Specializing in fresh homemade hummus with only fresh, locally-grown herbs. From our family to yours. Share it, Spread it, Love it! 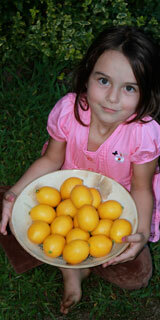 We only use fresh squeezed lemons in our hummus. None of that artifical juice in a bottle. We support small business. We purchase all our packaging from local suppliers and use freshly grown herbs from local farmers when in season and available. We never use dried herbs. Visit us at upcoming festivals and farmer's markets. Each week we will have a Flavor of the Week and we will take suggestions from our customers on what you may like to see. You never know, your recipe might just be tested and enjoyed by many hummus lovers. And when you buy 5 Flavors of the Week, you get your 6th one for FREE! Visit us on Facebook and follow us on Twitter.